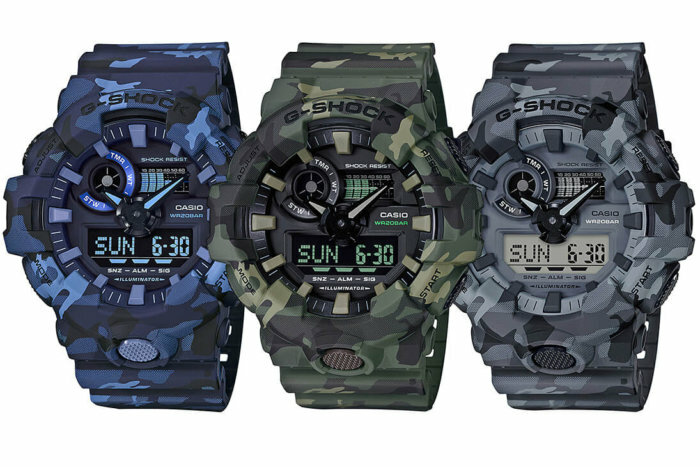 It’s a popular motif for recent collaboration models but there’s been a dearth of regular camouflage G-Shock releases lately. 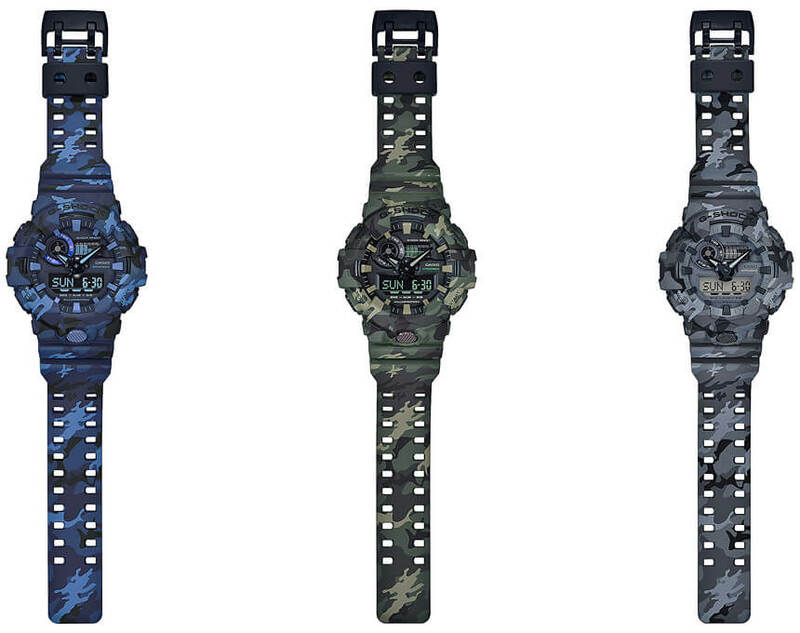 That’s set to change with the G-Shock GA-700CM Camouflage Series. These camo models are based on the extra-large, 53.4 mm-wide GA-700 which has a front LED light button and the longest battery life (estimated 5 years) for a non-solar analog-digital G-Shock. These models feature a traditional woodland camouflage pattern on the bezels and bands in three color options: GA-700CM-2A (blue), GA-700CM-3A (green), and GA-700CM-8A (gray). Unlike most other GA-700 models, the GA-700CM series does not have the metallic-style analog hands in favor of a more subdued look with black-coated hands like the GA-700UC Utility Color Series. The GA-700CM-2A and GA-700CM-3A have reverse LCD displays and the GA-700CM-8A has a standard LCD display. G-Shock Japan is releasing the GA-700CM-2AJF, GA-700CM-3AJF, and GA-700CM-8AJF in February 2018 with a list price of ¥18,500 JPY each. The GA-700CM series is also expected to be released internationally. Update: The GA-700CM-2A, GA-700CM-3A and GA-700CM-8A were released in North America with a list price of $130 USD each. 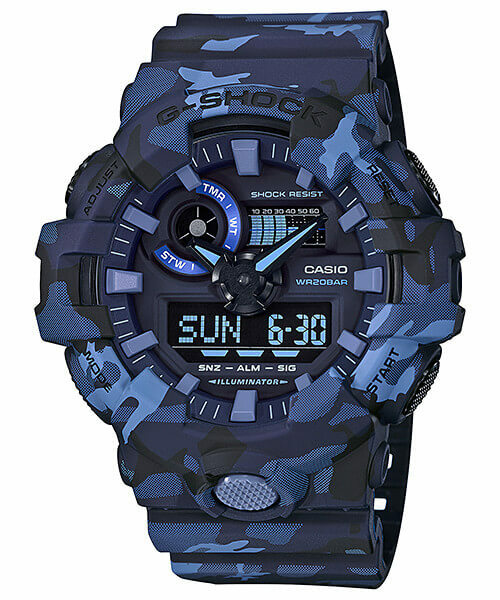 Blue woodland camouflage with blue-tinted reverse LCD display. 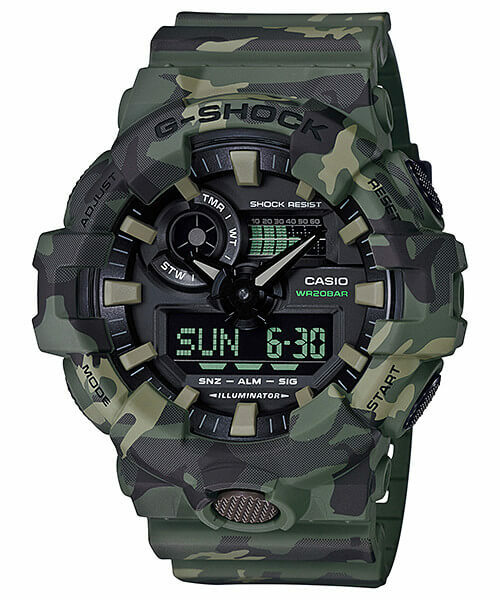 Green woodland camouflage with green-tinted reverse LCD display. Gray woodland camouflage with standard LCD display.